In this post, we recommend a blog post Dr. Larry Dossey published in Reality Sandwich, entitled "The Brain as Filter: On Removing the Stuffing from the Keyhole." He presents the brain as a filter of a larger reality and mentions several other thinkers, past and contemporary, who have shared this view, citing, for instance Filters and Reflections: Perspectives on Reality (ICRL Press, 2009), where you can read IAC instructor Nelson Abreu's contribution on the theme. In his chapter, he argues that the development of multidimensional awareness as studied and promoted at IAC and elsewhere (through mastery of out-of-body experiences, clairvoyance, subtle energy and more) leads us closer and closer to the "Source" reality discussed in the essay that inspired the book. 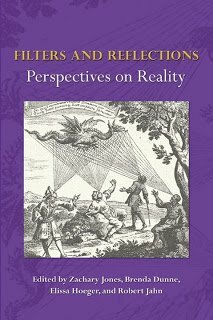 Abreu posits that the "channels" and "filters" of perception - metaphors developed by Brenda Dunne and Robert Jahn at Princeton University - are not solely of the material realm (physiological, social, psychological...) but rather multidimensional, as proposed by projectiology's consciential paradigm. You can listen to Brenda Dunne's introduction to Filters, below. Remainder of Filters webinar series available at http://www.icrl.org Dr. Larry Dossey is a former physician of internal medicine and former Chief of Staff of Medical City Dallas Hospital and is known for his research and educational work on distant healing. Dr. Dossey is the former co-chairman of the Panel on Mind/Body Interventions at the National Institutes of Health. Dossey has lectured at medical schools and hospitals throughout the United States and abroad. In 1988, he became the first physician to deliver the annual Mahatma Gandhi Memorial Lecture in New Delhi, India. He is the author of 10 books dealing with consciousness, spirituality, and healing, including the New York Times bestseller Healing Words: the Power of Prayer and the Practice of Medicine. His latest book is The Power of Premonitions. He is the executive editor of the peer-reviewed journal EXPLORE: The Journal of Science and Healing. Our body has two life-sustaining filters, the liver and kidneys. Our five-pound liver traps toxins and other substances that enter the body and neutralizes them in quick order. When it is functioning at peak capacity, it can filter two quarts of blood a minute. Our fist-sized kidneys also are sophisticated filters. Each day they process approximately 200 quarts of blood, reabsorbing valuable elements and filtering out around two quarts of wastes and extra water, eliminating them via the ureters and bladder. But perhaps the body's most efficient filter goes largely unnoticed: our brain. Huxley, like Henri Bergson, Ferdinand Schiller, William James, and others before him, believed the brain functions as a filter, normally shutting out perceptions, memories, and thoughts that are not necessary for the survival and reproduction of the organism. Rather than producing consciousness, these observers believed the brain largely eliminates it, diminishing what consciousness is capable of revealing to us. As astrophysicist David Darling says in his book Soul Search, we are conscious not because of the brain, but despite it.